In the 1870s croquet had already reached South Africa and contemporary writers refer to croquet being played “under the oaks in Wynberg “Cape Town” and “in the park at Pietermaritzburg”. Information regarding the subsequent development of the sport is sketchy, but it is clear that it first spread within the two British colonies of the Cape and Natal. There are, for example, references to croquet clubs in places such as Beaufort West, Oudtschoorn, Mossel Bay, Graaff Reinet and similar country towns. It is not known what version of croquet was played in this period, but what is noteworthy is that in the Cape Colony, with its dry summers, it was generally played, not on grass, but on clay/gravel. In Natal, however, the climate would more likely have permitted grass courts to be used, although even there gravel/clay courts are known to have existed. At a later stage, with the British occupation of the former Boer republics, croquet spread further into the north of present-day South Africa, with clubs springing up in places like Harrismith in the Free State and Pretoria, Johannesburg, Boksburg and other mining towns in the Transvaal. 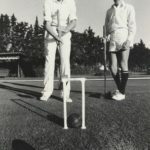 Indeed, in a monograph on croquet in South Africa, written in the 1950s, a former South African croquet doubles champion, Lt.Cdr Alex Clark suggested that there were probably a good hundred or so croquet clubs in existence throughout South Africa in the early years of the nineteenth century. Many of these clubs were however single court clubs, not linked to any associations and as elsewhere in the world, interest in the sport was often overtaken by the emergence of other sports. The support for croquet was apparantly sufficient by 1911 for the first recorded South African croquet championships to be held at Newlands, in Cape Town, in the grounds of the Western Province Cricket Club. Two years later, what is today one of the leading clubs in South Africa was established at Rondebosch, Cape Town. 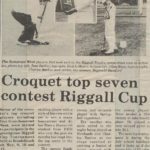 At least two provincial croquet associations came into existence, one in Natal with clubs in Durban (Berea and Montpellier Road), Pietermaritzburg, Pinetown and Richmond amongst others. In the Western Cape the leading club was in the Strand, near Cape Town, with clubs at Rondebosch, Simon’s Town, Sea Point, Pinelands, Malmesbury and Stellenbosch. In 1936 a certain Mr Oakeshott took the initiative in bringing about the foundation of the South African Croquet Association (S.A.C.A.) which occurred in the following year, with Mr Oakeshott as first President. 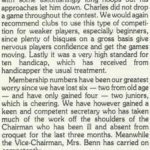 South African croquet championships were resumed in East London (where there were at least two clubs), play being for the Belcher Cup, donated by Captain Reginald Belcher, who succeeded Mr Oakeshott as President, following the latter’s death that year. The headquarters of the S.A.C.A. was initially in Natal and after the Second World War, sterling work was done, with limited resources, by George Neaves, a six-times South African singles champion, as secretary. Neaves was based in Pietermaritzburg, as was Myrle Simkins, who took over from Captain Belcher as President for sixteen years. She in turn handed over in 1972 to Ian Gillespie, from the Rondebosch club, who was to continue in the post for the next 22 years until his retirement in 1994.He was succeeded by Advocate Brian Bamford until his death early in 2003. The 1953 and 1957 South African open singles champion, Edward L. Ward-Petley, of Bellville, was the most distinguished player in South Africa. 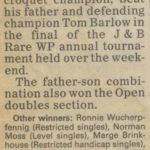 Winner or joint winner of such events as the English men’s championship (1947), open doubles (1935), mixed doubles (1939,1947), Ward-Petley was invited to play for England in Australia in the 1935 tests and in New Zealand in the 1950 tests. 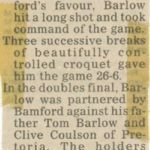 In 1946 he tied for first place for the President’s Cup, played in England, and generally regarded as the world croquet championship. 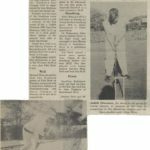 By the 1970ties, despite the best efforts of George Neaves, Myrle Simkins and others, croquet had seen a steady decline in support and less than ten clubs remained affiliated to SACA. In the Western Cape Rondebosch became the last remaining club in 1956, the year that Ian Gillespie, then in his early twenties, joined (later to become president). 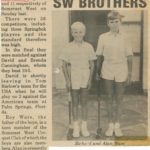 Fortunately a number of younger players then joined the club and by 1963, after a break of over half a century, the South African croquet championships were once again held in Cape Town. 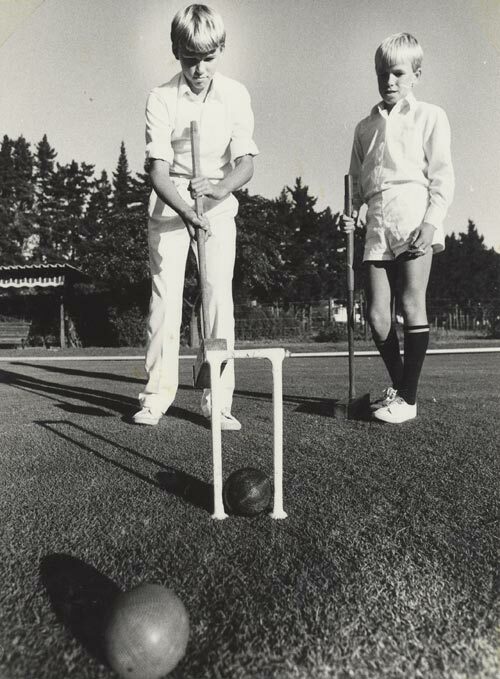 The site was the Rondebosch Croquet Club which had just moved (thanks to a road-widening) to new premises with three courts (two grass and one gravel) after fifty years of only playing on gravel. The greater attractiveness of playing on grass plus sterling support by players such as Dilys Hobbs, first as secretary and then as president of the club, gave a considerable boost to the sport in Cape Town. Considerable efforts were now made to improve the standard of play. 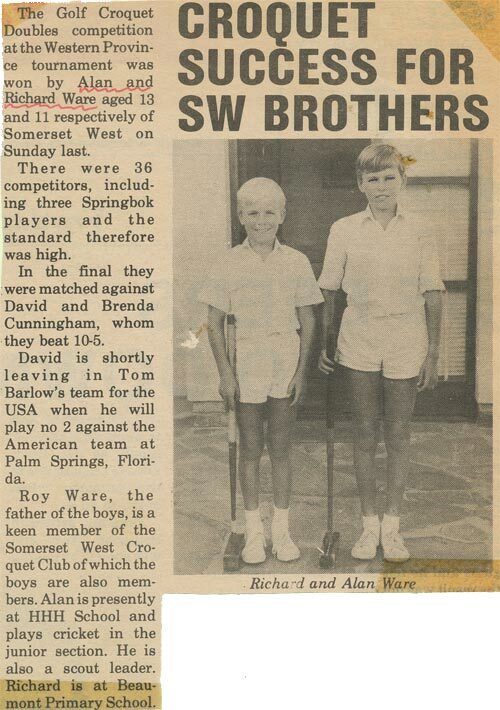 Earlier the sport had benefitted from the skill of such players as Edward Ward-Petley, a former England player, who had moved to the Cape, Alex and Dorothy Clarke (a gifted doubles pair with Australian connections) and George Neaves. Now, with small Government subsidies, it was possible to invite players such as Patrick Cotter, William Ormerod, Bryan Lloyd-Pratt, John Solomon and Richard Rothwell (secretary of the British association) to tour South Africa giving clinics and conducting referee examinations. With the resultant improvement in standards the first national (Springbok) team was put together in 1976 for a visit to Britain. The team played in several centres in England, including Hurlingham, Roehampton and Cheltenham and played a single two-day test against Scotland in Glasgow, being well beaten by 4 games to 1, with one drawn. The team consisted of Tom Barlow, David Cunningham, Lester Sullivan and Ian Gillespie. Lester Sullivan was the one winner, whilst he and Ian Gillespie, playing on a sun-baked court reminiscent of gravel, drew their doubles encounter by one game each, there being no time left for a decider! 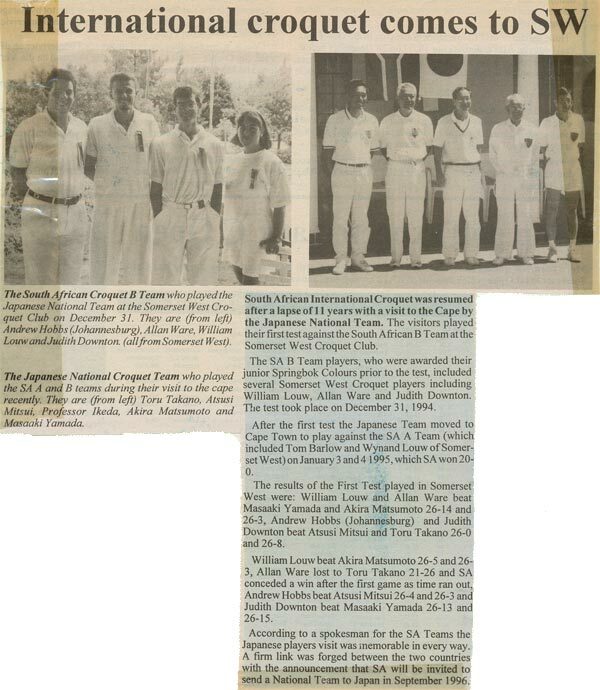 In 1981 croquet was invited to participate in the South African Games, held in Pretoria, where the South African A and B teams, led by Tom Barlow and Ian Gillespie respectively met each other, the A team, not unexpectedly proving the winners. 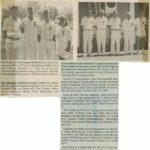 Notable was the presence, as official observer, of Jack R. Osborn, founder and president of the U.S. Croquet Association. This led to an invitation to visit the U.S. the following year. In the northern spring of 1982, accordingly, a six person Springbok team travelled to Palm Beach, Florida to play a test against the U.S. alternately playing according to International Laws and U.S. Association Rules. 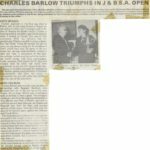 South Africa won the event by the narrowest of margins, with Carole Jackson then Knox, and a young schoolboy, 14 year old Reginald Bamford winning the deciding game when Jackson, the only woman member of the team scored the peg-out. These international encounters were the precursors of a series of international matches featuring Scotland, an English team, Ireland and Japan. 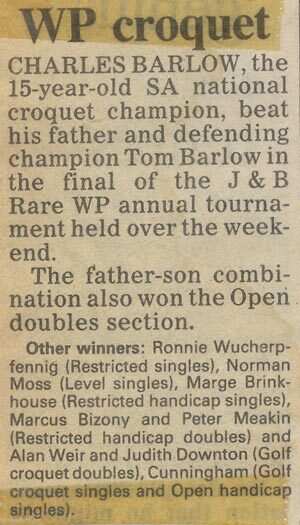 Recent years have also seen the participation of individual South African players such as Tom Barlow and Reginald Bamford in overseas events, culminating with Bamford winning the official World Championship, not once, but twice, the latest occasion in August 2005. In South Africa itself, however, the fortunes of the sport have swayed, especially since the cessation of the small but most helpful Government subsidies in recent years. 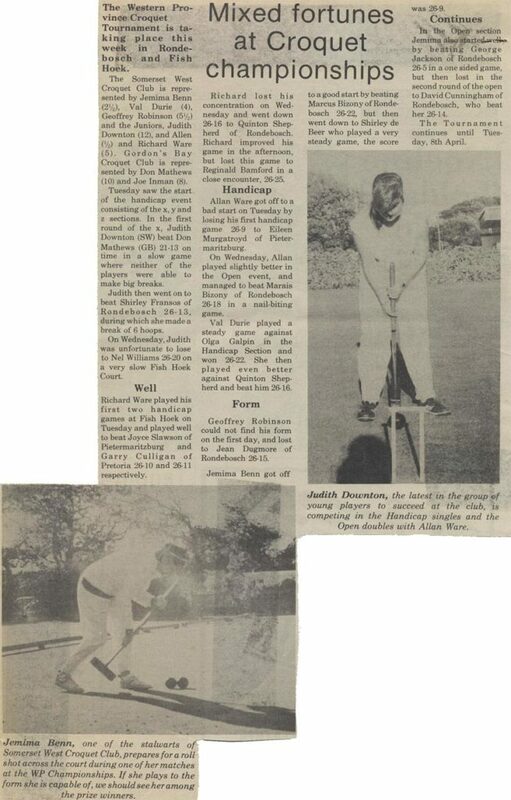 The “South African Croquet Chronicle” issued by Brian Bamford, David Cunningham and Tom Barlow, did sterling work in encouraging interest and support of croquet. The Western Province Croquet Association has held regular tournaments which have been well supported by overseas visitors. The Kelvin Grove Club has had considerable support in encouraging golf croquet and new clubs have been formed in Fish Hoek, Somerset West and at the Waterfront. On the other hand support in KwaZulu/Natal has been restricted to Durban and Pietermaritzburg. In the former Transvaal, the old Pretoria club no longer exists but new clubs have sprung up in Johannesburg and in the Eastern Cape there now exists three clubs. 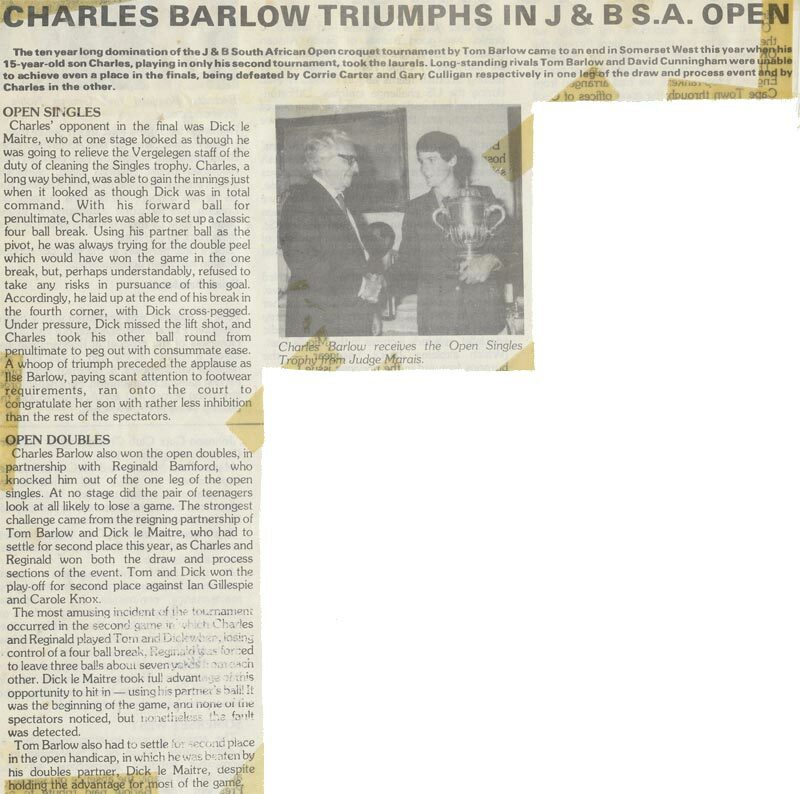 The headmaster of George Randell High School, East London,came across it when he was going through a cupboard sorting out what he calls “obsolete cups” which are to be put on display. It is a beautiful, hallmarked silver cup about 33cms high on its stand, with a lid surmounted by three croquet mallets over a ball. The cup was played for regularly from 1932, the winners being: 1932, Mrs Wessels, 1933, MrsPreston; 1934, Mrs Currie; 1935 , Mrs Mills; 1936, Mrs May Fleischer;1937 , Mrs Moore (Durban); 1938, Miss M Paterson (Port Elizabeth); 1939, Mrs Preston; 1940, Mrs Hamlyn; and in 1941, 43, 44 and 45 (it does not apprea to have been played for in 1942), Mrs A Clark. If one can go by the badges on the cup 1945 was the last year it was competed for. Mr Denyer has no idea how the cup came into the possession of George Randell High School. Daily Dispatch sports editor, Percy Owen, had never heard of the Oakeshott cup for croquet, though he knew about the Oakeshott cup for second league rugby in this part of the world. Mr Denyer would welcome information about the cup. With all those prize winners, and the fact that A. C Oakeshott was well known in this town, somebody must know about it. He can be phoned at George Randell school during school hours (7.30 am to 1 pm). his telephone number is …..